I suppose it would be best for Yokota-san to comment on the Super Mario Galaxy theme song since he was the one who made it. Okay. My life was at its lowest point when I made this. Kondo-san was rejecting every single song I made. I was seriously thinking I might have to quit the company. It was the first time in my life I’d ever thought anything like that. I’d always made music under the idea that Mario was cute, but Kondo-san said that Mario was cool. The songs I wrote under that new conception were “Gusty Garden” and this one. So this song represents my joy at crawling up from the depths of despair. 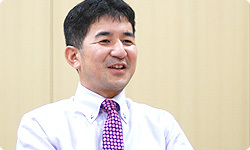 If you want to know more, read the session of “Iwata Asks” on Super Mario Galaxy. And then you participated in the orchestration for Super Mario Galaxy 2. It wouldn’t have been orchestral if it weren’t for Yokota-san, but I think it was good for expressing the expansiveness of outer space. I wasn’t in charge of this song, but I think it’s a theme song that preserves the special feeling of Mario games while also expressing the vast expanses suggested by the name Galaxy. Next is the title theme for New Super Mario Bros. Wii. Nagamatsu-san, you made this, right? Yes. It was the first time I had worked on the Mario series, so this song is really important to me. Well, if he didn’t like the song it wouldn’t be on this CD. 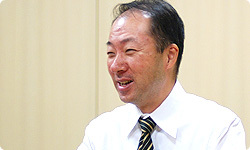 When we were developing New Super Mario Bros. Wii, I had the chance to ask everyone how their work was going, and Nagamatsu-san said that he was getting a feel for how to make music for the Mario games. Did you just blurt that out in a moment of excitement? If there’s a trick to it, tell me! At that time, development of Mario Kart Wii had ended, and we were midway through development of New Super Mario Bros. Wii. I think I made a couple of songs. I think it was a time when, by pure chance, Kondo-san didn’t shoot them down. (laughs) But when I hear this song for New Super Mario Wii, there are parts where I think he’s got it. Yeah. Not the whole thing. It’s a catchy, fun song. I think everyone in charge of the music worked really hard. The other songs are also richer-sounding than in the DS version. The music preserves the Mario spirit and turned out well. 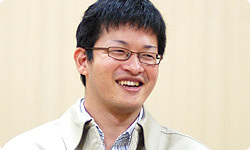 Yokota-san, you also made the last song, the theme song from Super Mario Galaxy 2. I was able to do a lot that I wanted to with Super Mario Galaxy 2 and I was finally beginning to understand the music of the Mario games, so it’s a work that holds many memories for me. It’s more sophisticated than the music for the first Super Mario Galaxy, and makes a striking impression. I feel like the music for the first Super Mario Galaxy shows Yokota-san’s idea that making Mario music is difficult, but with Super Mario Galaxy 2, there’s an atmosphere of fun and a feeling that he flew through outer space. You could say he’s gradually come into proficiency. I’m looking forward to what these two will do from now on. The musical tradition of Mario will live on. 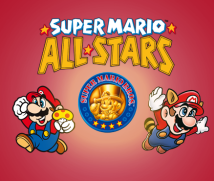 Today it’s become clear to me what you thought as you made the music for the Mario games, but if I may insert a plug, I think it would be great if everyone reads this again after listening to the CD in Super Mario All-Stars. Today, several of the mysteries surrounding Mario music were solved for me. I actually want to do another “Iwata Asks” before the next Mario project begins. Then it’ll be easier to make the music. Until now, nothing was ever clear to me until after development was over. 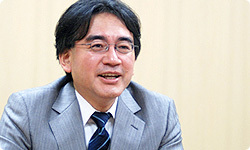 Like “Iwata Asks Ahead of Time”? (laughs) I realised some new things today, too. I was able to ask you a lot about what makes Mario music unique. And in addition to the ten songs we just introduced, the CD holds some bonus sounds, as well. Right. There are ten familiar sound effects like getting coins and an extra life, so I hope everyone will enjoy those as well. Now I’m looking forward to getting this CD in my home more than ever! Thanks for your comments today, everyone.